A new simulation suggests our solar system's giant planets, Jupiter and Saturn, could have played an important role in helping life get a foothold on Earth. KISSIMMEE, Fla. — Without Jupiter and Saturn orbiting out past Earth, life may not have been able to gain a foothold on our planet, new simulations suggest. The two gas giants likely helped stabilize the solar system, protecting Earth and the other interior, rocky planets from frequent run-ins with big, fast-moving objects, researchers said. "If you don't have giant planets in your system, you have a very, very different planetary system," Tom Barclay, of NASA's Ames Research Center in Moffett Field, California said here Friday (Jan. 8) at the 227th meeting of the American Astronomical Society. Barclay and his colleagues found that massive impacts — such as the one involving the proto-Earth that's thought to be responsible for the formation of the moon 4.5 billion years ago — would happen more frequently, and for a longer time periods, in solar systems that lack giant outer planets. Such giant impacts could result in the loss of a planet's atmosphere, potentially making the world uninhabitable, Barclay said. "If you have giant planets, your last giant impact happens somewhere between 10 and 100 million years [after planet formation], which is pretty fine — it's like what happened on Earth," Barclay said. "If you don't have giant planets, the last giant impact can happen hundreds [of millions] to billions of years in. This really is a risk to habitability." 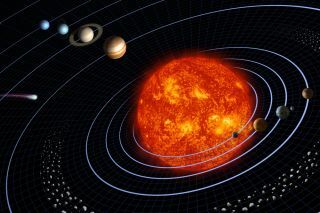 As a solar system forms, planetary building blocks and debris zoom around in a broad disk before eventually aggregating into planets with stable orbits. Barclay's group started its simulation after Mars-size planet embryos had already formed in the system, and looked at cases with and without giant planets on the outer perimeter. The researchers found that, with giant planets around, the remaining small solar system bodies were either ejected out of the system more quickly — because of the angular momentum the gas giants add to the system, Barclay said — or became a part of the existing planets sooner. Without the influence of giant planets, the fragments formed a large, dangerous cloud orbiting close within the system that took much longer to disperse — kind of like a closer-in version of the icy Oort Cloud, a shell of debris that orbits in the outer solar system and occasionally casts comets toward Earth. The giant planets' effect was only a small part of what the researchers were investigating with their new simulation, which attempts to fix two major problems with other models of the final stages of planet formation, Barclay said. First, the researchers took into account the fragmenting that occurs when objects ram into one another, rather than assuming they combine perfectly. And second, they ran hundreds of simulations to see all the possible ways the chaotic formation process could play out. "Things that aren't rare but aren't especially common don't show up in typical simulation runs like this," Barclar said. "So you need to run a really large number."